General Grow was the first surgeon general of the U.S. Air Force (July 1, 1949 - November 30, 1949). He received his medical degree from Jefferson Medical College in 1909 and entered the U.S. Army Medical Service in 1917. While chief flight surgeon of the Army Air Corps (1934-39) he, in conjunction with Major General Harry G. Armstrong, founded the Aero Medical Laboratory at right-Patterson Air Force Base, Ohio. In July 1943, General Grow received the Legion of Merit for developing body armor to protect combat crews. A study of wounds incurred by members of combat crews showed that nearly 70 percent were caused by missiles of relatively low velocity. He led the way in developing a light body armor and steel helmet that save many lives and materially improved combat crew morale. failures in combat, he helped institute rest homes, a new special pass system, and special training for medical officers in tactical units. As a result, every casualty of this type was returned to duty. Such efforts, especially in research, won for him the John Jeffries Award in 1947, the Gorgas Award in 1950 and many others, including many from other nations. Just prior to his retirement, he received an oak leaf cluster to his Distinguished Service Medal for his efforts in promoting the study of aeromedicine, airborne medical equipment, and organizational planning. General Grow was appointed acting air surgeon for the Army Air Forces in 1945 and Air Surgeon in 1946. 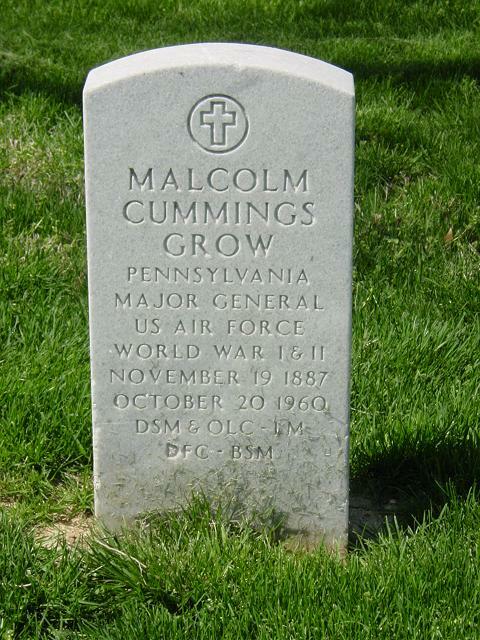 General Grow was buried with full military honors in Section 34 of Arlington National Cemetery.